The most important message for every person is that of the need for repentance - by one of the last great Puritan preachers, Thomas Boston (1676-1732). With wonderful exposition, Boston opens up a multitude of scripture passages on an issue that it is the duty of every Christian to tell the world of - the impending judgment that awaits each one of us, the call for repentance now, and a message of hope and assurance only to be found in Christ. 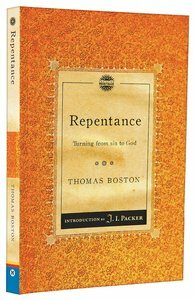 About "Repentance: Turning From Sin to God (Christian Heritage Puritan Series)"
Boston was a Scottish Presbyterian minister. He studied at the University of Edinburgh, and was a recognized Hebrew scholar. His main pastorate was at Ettrick, Selkirkshire, where he was installed in 1707. This is a classic explanation of the Puritan approach to evangelism that is also an encouragement for anyone who wants to explain the gospel. Boston had a sensitive spirit and a first class mind. A man with a retentive memory but also a way with words, he always thought best with a pen in his hands, writing out ideas and arguments as they came to him. This is a classic explanation of the Puritan approach to evangelism that is also an encouragement for anyone who wants to explain the gospel. In an extensive prologue, J.I. Packer shows us a little of the life and times of Thomas Boston and the background to the writing of this 18th century classic. 'The "scribble", so Boston tells us, was published in 1773. Since then it has been hailed by evangelicals as a masterpiece on ministry... The idea of a beginning preacher of 22 producing a spiritual masterpiece is startling, no doubt. But Boston was an unusual man.' - J.I. Packer. A Puritan's View of Atonement. Stephen Charnock links the Old and New Testaments with his learned and fresh explanation of how the sacrificial system is satisfied by Jesus' one atoning sacrifice. He shows how this work was achieved with full prior knowledge of both the Father and Son in order to bring us blessings of a new covenant. "Sentence after sentence in Charnock's ordered march lights up and glows in your heart" - J I Packer. - Publisher. The principal concern of Bunyan's great allegories was to assist the Christian in discerning the way to heaven. Drawn from Bunyan's meditations on the Pauline concept of "running to win the prize" (1 Corinthians 9:24), The Heavenly Footman is a classic Puritan text on facing the challenges of Christian living. Bunyan's "Footman" is an athlete who perseveres in the effort of "winning" the race. Bunyan's terse and urgent style imparts vital guidance on how to stay the course. Bunyan wants Christians to meet the challenge of the race so that we might all meet in Heaven. As he states in this book: "Farewell, I wish our souls may meet with comfort at the journey's end." Bunyan is well known for his perception and discernment in depicting human motivations as he gives us the "description of the man who gets to heaven". "This is the true, heart-searching, heart-warming John Bunyan, on full throttle"
- J.I. Packer, from his Introduction. The supplier of this item is out of stock. There will be a delay in the fulfillment of this item. We will keep your order on file and notify you of any changes to this items status. 0 Available.